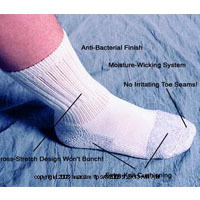 Discount Medical Supplies has all the foot care supplies you need to keep your feet healthy and happy. Remember the words of the great Leonardo da Vinci "The human foot is a masterpiece of engineering and a work of art" and as such, you need to take care of both your feet. From the smell, to the texture, everything counts when we talk about Foot Care. Look into our extensive catalog of product to treat bunions, toes, corns, calluses, strong odors, plantar fasciitis, and others. Pamper your feet with our foot massage supplies, products for sensitive feet and more. We have it all at the lowest prices available on the online medical supply industry.